5-Bolt SAE Probe - Princeton Electronics, Inc. This is our 5-bolt SAE probe. Available in 3 standard lengths of 12", 18" or 24" with a 5" bendable section (used for when the probe needs to be bent in two different directions). The 5-bolt SAE probe is available in custom lengths for an additional charge (additional charges apply to probes over a length of 24"). This is our 5-bolt SAE probe. This item is available for a custom length probe between the measurements of 25" and 48". Please note the length required. This is our 5-bolt SAE probe. This item is available for a custom length probe between the measurements of 48" and 110". Please note the length required. 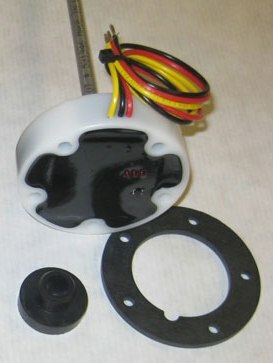 This kit includes a flange mount gasket, a metal bracket, as well as 5 mounting bolts and 10 washers.